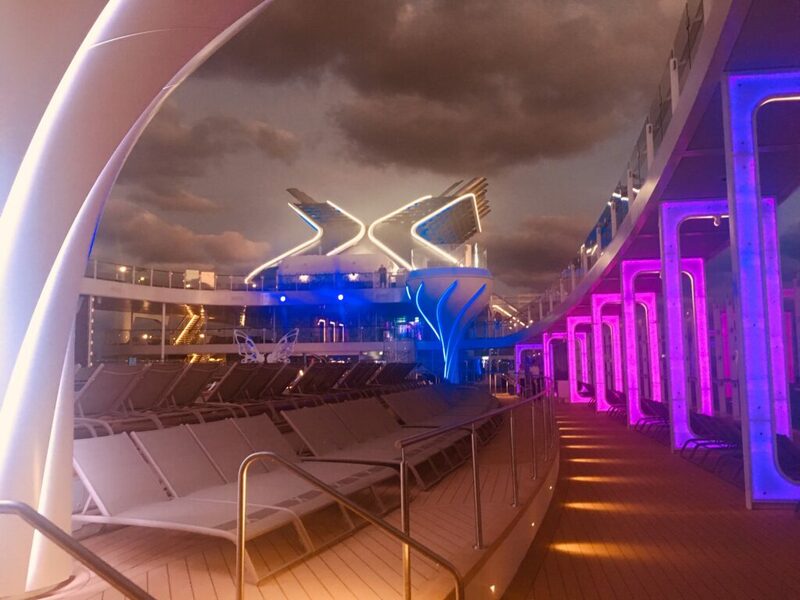 Since choosing a cruise for family gatherings makes logistical issues easy and fun, Family Travel Forum was eager to experience the new Celebrity Edge, touted as the “World’s Most High-Design Cruise Ship.” When her preview cruise sailed in December 2018, it gave us a chance to flash forward nearly a decade from a prior cruise vacation aboard Celebrity Equinox. 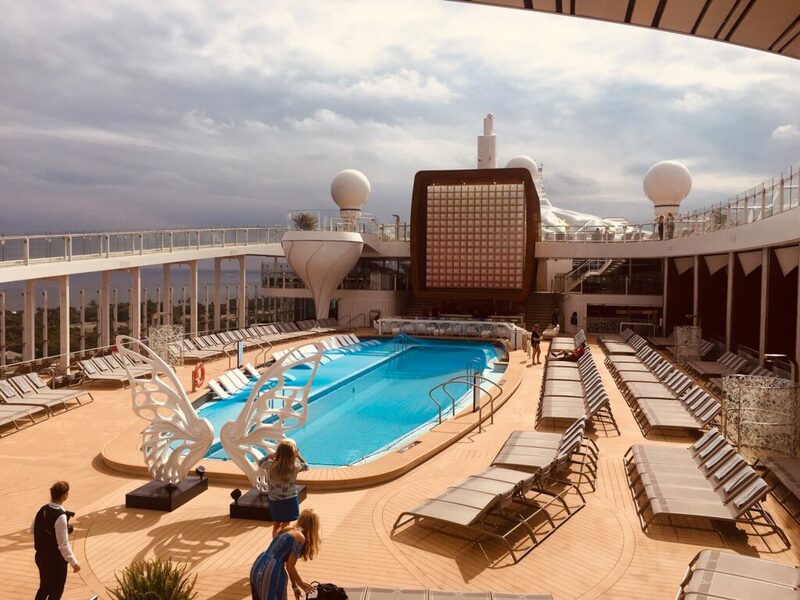 The Pool Deck of the Celebrity Edge has organized activities, outdoor movies, dining and more that make it the social hub of the ship. How do you take a great ship design and make it better? The future of cruise ship design and family innovations is easily evident aboard Celebrity Edge. 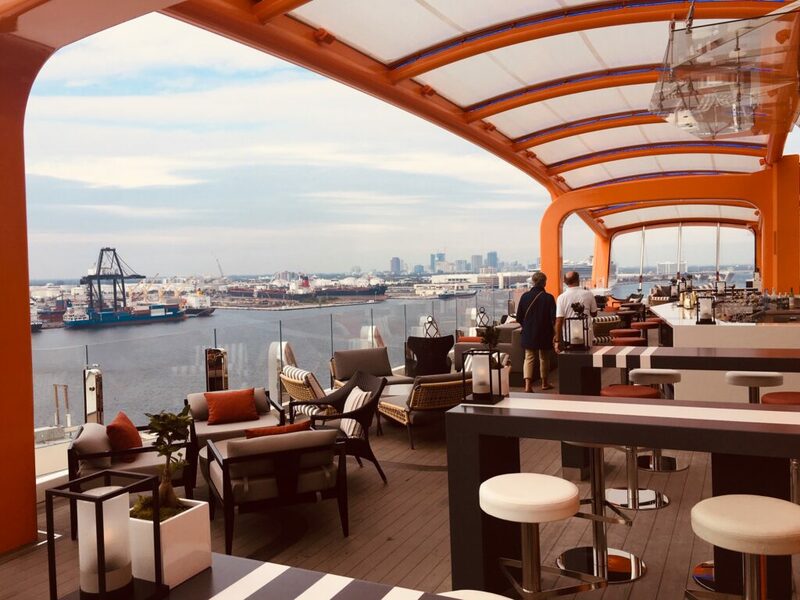 From the brand-new T25 Pier in Fort Lauderdale to the sophisticated, upscale Grand Plaza, Celebrity Edge is not the cruise ship of the 1990s, she is the future. Gone are hallmarks of our previous cruise on Celebrity; the central area atrium, almost 10 stories high, has been replaced by the Grand Plaza, three stories high. Elevators with glass sides for looking out? Gone. Multiple outdoor pools on the Resort Deck? Now one 25-yard lap pool. A communal dining room? Now four individual dining rooms, each with somewhat different menus. Kids Camp at Sea on a high deck? Now remanded to a lower deck with innovated programs, but no direct outside views. Verandas with chairs for sitting outside? Demonstrably, the most significant change. Having use of a ship’s balcony indoors and out is one of the innovations in design of the Celebrity Edge. The cruise ship veranda, what we would call a balcony, originated 30 years ago when another cruise line installed them on their then-newest ship. The cruise industry couldn’t get enough. What was a radical design change, became standard on almost every ship, with outdoor chairs, table and privacy walls. When Celebrity Cruise Lines started rethinking their new Apex-class of ships (the Edge is the first), the designers realized that there might be a different way to do this. More than 80% of the staterooms are veranda cabins. On the Edge, the higher-priced suites have actual verandas, but the veranda cabins have a large, almost floor-to-ceiling window that opens and closes as you wish, along with the two chairs and a table. You can stand by the window and gaze out into the open air or sit and look through the glass, or both at the same time. Most cabins are more than 20% larger than on other Celebrity ships and this feature makes the cabin seem even less cramped. Do you prefer a king bedded cabin? Almost every cabin has one. With 390 upgraded cabins in two different classes, the concept of a single class cruise ship has disappeared as well. 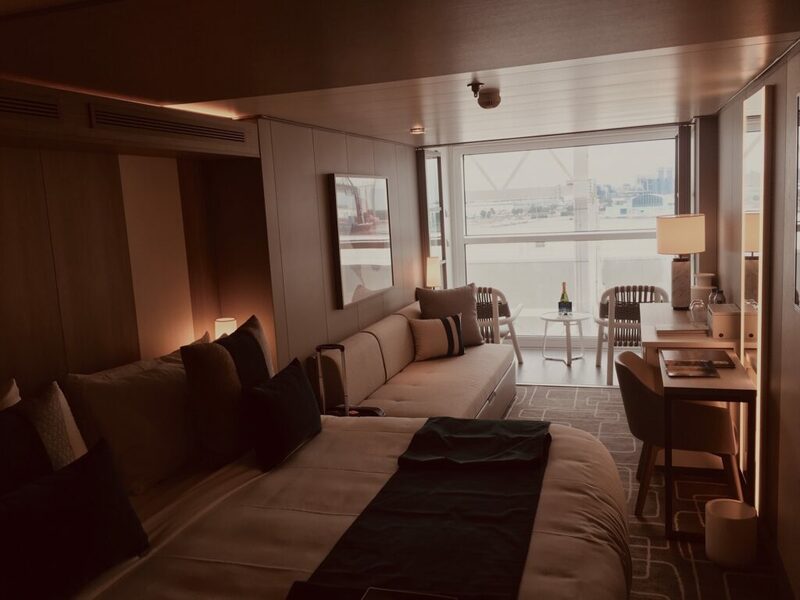 At the top of the rate sheet are suites – nearly 10% of the ship — which have access to a separate pool and deck area and private lounge along with Luminae, a private dining room. The task of accommodation design was given to British designer Kelly Hoppen (of Kelly Hoppen Interiors) – who derived a contemporary urban feel to staterooms and suites, which are neither garish nor minimal in design, the perfect place for a rest, a good night’s sleep or someplace to catch up on the world through a flat screen TV or on the web. The open air Rooftop Garden cafe on Celebrity Edge is one of the most sought after dining venues on the new ship. Want to change dining rooms without having to pay extra? There are four, with Italian, French, Mediterranean and American cuisine available, along with culinary standards perfect for fussy eaters. Fun fact: The central kitchen will wash 1,000,000 pieces of silverware on a 14-day cruise. More casual dining can be enjoyed at the Oceanview Cafe — a sumptuous buffet with different cuisines and a stunning ocean view, along with four other casual venues. Eleven bars and Lounges are available for the over-21s. Seven extra-charge venues are available for splurges: we sampled Le Petit Chef at Le Grand Bistro, which mixes food and a multimedia presentation… right at your table. Great entertainment for children over six. And don’t think that any children traveling along are forgotten. While upper deck space for Camp at Sea has been ceded to space for luxury suites, the new lower desk space has been revitalized, with a totally separate teen area. A new curriculum has been designed for Celebrity by Anturus, an organization dedicated to involving adults and children in science through travel. Through media and live demonstrations, their STEM programs will be enacted by on-board Camp at Sea staff, with cruise-related programs available for campers, based on age and interest and where they will be traveling. The Camp will welcome anyone from 3 years up to 17 with appropriate activities and coding will be offered as well, a popular activity. There’s more razzle dazzle on the exterior of the Celebrity Edge because the entire cruise ship lights up at night. The refinements in cruise ship design are outdoors as well as indoor. Tom Wright (of WKK) has re-imagined the main pool area and above that deck, created the Rooftop Garden. It’s not only a gathering place, but the most popular space for meals with a small kitchen, an imaginative extra-charge menu and an incredible outdoor sea view. The Solarium indoor pool area is both huge and intimate at the same time, vibrant yet restful. The biggest surprise of all? The Magic Carpet. No, this is not from Aladdin’s Tales. This one is an orange framed indoor/outdoor space that can hold 100 people. But, as they say, it gets better. On cruises, it will reside on the Pool Deck, an adjunct to the food and beverage facilities with the addition of outstanding sea views. The Magic Carpet moves from Deck 2, used for tendering in dock-less ports; on Deck 5, it is a fine-dining restaurant then moves to deck 14 for use as a bar and lounge. One caveat is pricing; expect to pay a quite a bit more for all this. At an informal gathering with Celebrity Line senior marketing staff, it was noted that the target audience for this ship was discerning Millennials with healthy discretionary incomes, not people looking at last minute deals. For families on a cruise, though, gone are the worries about packing and unpacking, securing a dinner reservation, organizing how everyone will spend time apart and together and seeing new and different places. If you are able to take advantage, a voyage aboard Celebrity Edge will be a most memorable journey on the High Seas.